For decades, the story of Alpena was pretty much tied to its massive cement operation – at one time the largest in the world. But offshore and beneath the waves, another resource lay dormant for decades: Some of the best freshwater diving in the world beckoned in this remote corner of northeast Michigan. Established in 2000, the Thunder Bay National Marine Sanctuary and Underwater Preserve holds more than 100 shipwrecks within its 4,300-square-mile boundary, some visible through glass-bottom boats just 17 feet down in crystalline waters. Tourists, researchers and divers – some from around the the United States – followed. The Great Lakes Maritime Heritage Center – a museum constructed as part of the Marine Sanctuary – now draws about 90,000 visitors a year. That's a big deal for a community of just over 10,000 people. “It has certainly had an impact,” said Mary Beth Stutzman, president and CEO of the Alpena Area Convention & Visitors Bureau. Stutzman said that's been just one part of Alpena's reinvention. Billing itself “Sanctuary of the Great Lakes,” Alpena also promotes stand-up paddleboarding, kayaking, hiking, biking as well as hunting for 300-million-year-old fossils from an ancient sea. “What really has had an impact is people who come for a multitude of reasons. They stay longer,” she said. There could be a lesson here for much of Michigan, which seems to be playing catch-up with states out west and even a place like Duluth, Minnesota, in aggressively promoting outdoor assets that speak to a new generation: Think REI instead of Cabela's. But it's more than ecotourism luring visitors and their credit cards to town. Analysts say that communities and states that adjust their outdoor marketing efforts make themselves more attractive to young talent and better positioned for economic development. “It's about making the kind of identity in how we sell the state,” said Brad Garmon of the Michigan Environmental Council, a Lansing-based nonprofit advocacy organization. Garmon said stakes are huge in Michigan, given that outdoor recreation in the state is calculated by the Colorado-based Outdoor Industry Association to be a $19 billion-a-year industry. Building more places where young professionals want to live and play. “It appears that today’s young people are different from every previous generation in their desire for amenities—restaurants, bars, theater, sporting events, and recreational activities. Many young people are now willing to go to a cool place first, and worry about the job later,” Ballard said. Western states like Utah, Colorado and Montana are ahead of Michigan in that regard. They have created government offices solely dedicated to promoting outdoor recreation. Oregon and Idaho are reportedly considering the same. Thus far, no state east of the Mississippi has created such an office. Utah became the first, when Gov. Gary Herbert created the Office of Outdoor Recreation in January 2013. It is dedicated to all aspects of outdoor recreation, in concert with nonprofit groups and the business community. In January, Herbert named Tom Adams, sales director for Petzl, a manufacturer of high-end climbing equipment, as second head of the Utah office. Beyond his business background, Adams is also known for expertise as a rock and ice climber, downhill skier and as a competitive cyclist. “The reason so many people come to college here and never leave is because of their access to all of the things they can do that are just 15 minutes away,” Adams said. He pointed to Park City, a community known as a downhill ski mecca but also for access to 400 miles of mountain bike trails. As an example of public-private models he hopes to spread, he cited Grand County and the city of Moab, which has a reputation for world-class mountain biking. Adams said the county has folded a volunteer trail-building organization called Trail Mix into its government functions, lending it funding stability and a greater presence in the community. A spokesman for the Outdoor Industry Association, a nonprofit advocacy group, said states like Utah have laid down a template others should follow. Outdoor Michigan has long been associated with hunting and fishing, which still account for more than 70,000 jobs and nearly $5 billion -- about a fourth of the state’s outdoor industry in annual economic impact, according to a 2016 state report. But like the rest of the nation, Michigan has seen a steady decline in the numbers of hunters and anglers, a trend that goes back a decade or more. From 2009 to 2015, the number of resident hunters in in Michigan dropped 10 percent, from 769,875 to 695,747. From the mid-1980s to 2015, the number of fishing licenses fell by a third, from 1.64 million in 1985 to 1.1 million in 2015. So too, the millennial generation seems less drawn to golf, as well. Michigan’s golf industry - which boomed with new development in the 1980s and 1990s - has gone through a painful retrenchment in recent years as would-be young golfers found other interests. The reasons could be this simple: Takes too long. Boring. The Detroit Free Press reported in April that about 200 golf courses have closed across the state over the past 15 years. Michigan Department of Natural Resources spokesman Ed Golder said the agency “does a great deal to support and promote outdoor recreation users of all interests,” including state park and recreation area activities like mountain biking, geocaching, paddleboarding and yoga on the beach. Golder notes that the Natural Resources Trust Fund – endowed by royalties from the sale and lease of state-owned mineral rights - has provided more than $1 billion since 1976 for outdoor recreation of all types, naming park development, trails and kayak launches in addition to support for hunting and fishing. He added that the fund now prioritizes recreation projects in urban areas. Outside of the the DNR, Golder said, the Michigan Department of Transportation projects investment of $83 million in non-motorized trails around the state from 2015 to 2017, including state funds, grants and local matches. But Golder also noted that new trends in outdoor activities are prompting the state to find new ways to support conservation efforts. Michelle Grinnell, spokesperson for the Pure Michigan travel campaign, said her office is looking to shine a brighter light on outdoor assets that might not be so well-known outside the state. Pure Michigan is budgeting $34 million for its 2017 campaign, much of that for radio and TV ads that run in all 50 states. Viewers are likely to see more, iconic images of Great Lakes shoreline, lighthouses and the Mackinac Bridge. 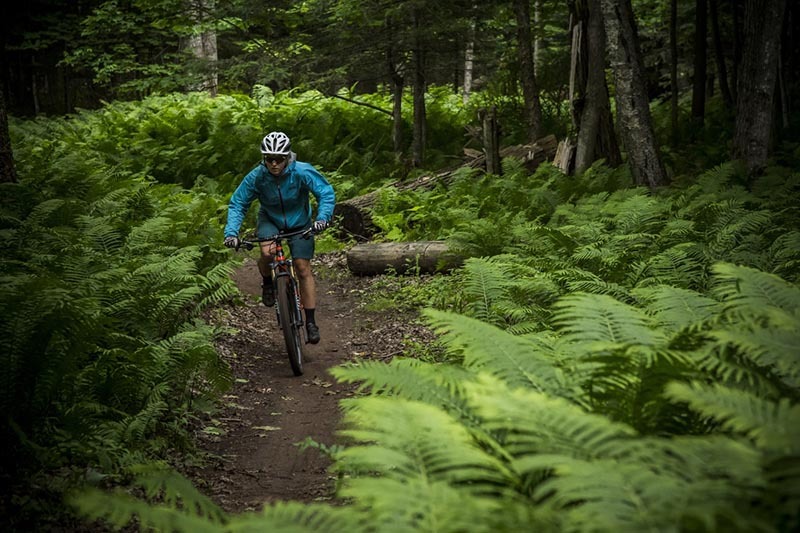 But Grinnell also noted its promotion of mountain bike trails at Copper Harbor in the Keweenaw Peninsula, named by the International Mountain Bicycling Association as a “silver-level” ride destination - one of only 10 such places in the world. Grinnell said Pure Michigan is planning an ad campaign for the trails there and at Marquette through Freehub Magazine, a mountain bike publication. “We are looking at mountain biking and our trail system,” Grinnell said. “All states have trails, but the diversity and quantity and quality of trails that we have is really a big thing. We know we have a great product to offer. For bikers, nowhere to go but U.P. In the Upper Peninsula, Marquette is making a name for itself as a mountain bike destination, even as it draws other adventurists. The latter includes an active surfing community, especially in the sometimes-wild months of October through March, when waves near shore can reach 12 feet. Bikers from around Michigan but also Wisconsin, Illinois and Minnesota – and even states like Utah and Colorado – converge in Marquette to sample a hundred miles of single-track trails in Marquette County through a challenging mix of rugged north woods terrain. In 2013, Marquette earned a spot in USA Today's “Top 10 Mountain Biking Towns,” taking a place alongside Park City, Utah, and Santa Fe, N.M, among others. A crew from Bike Magazine spent 10 days in June shooting photos and video of trails from Marquette to Copper Harbor. It is expected to be released as web video within a couple of months. “It's going to be amazing,” said Candy Fletcher Kozeluh, recreation director for the Marquette County Convention and Visitors Bureau, who accompanied the crew on the trip. That probably won't hurt her outreach efforts to Chicago, where die-hard mountain bikers are more and more apt to make the six-hour drive north. When they do, Kozeluh said, they're likely to stay at least several days. She said a group of 60 from Chicago booked a visit over July 4th. A lot of this has happened with little help from government. Over the past 20 years, the Noquemanon Trail Network – an expansive mix of cross-country ski and single-tracking mountain bike trails – has grown through backing from a nonprofit organization, membership donations and contributions from community businesses. Bikers beget bike shops, which is why a city of just over 20,000 people has four bike shops. They stay relatively busy even in winter, when fat-tire bikers ride the snow on 60 miles of groomed trails. With all these riders, it's not surprising Marquette County has six microbreweries. Scott Jordan, assistant professor of Outdoor Recreation Leadership and Management at Northern Michigan University, said anecdotal evidence tells him Marquette's outdoor cache is attracting new talent to the region. “It's highly likely that people want to live here because we have things like very nice mountain biking trails,” he said. He noted, for instance, that faculty positions at NMU might not pay as well as Michigan State University or the University of Michigan. “But we have the opportunity to go out and ride right from our offices,” Jordan said. Jordan authored a 2015 study of Marquette's mountain bike community, noting that industries like forestry and mining have a limited future. Earlier this year, Cleveland-based Cliffs Natural Resources announced it would lay off 400 workers at its Empire iron ore mine west of Marquette, with plans to close the mine within months. Lyle VanderSchaaf, 45, an emergency room physician who grew up in Iowa, said he settled in Marquette largely because of its outdoors. A father of three, he's an avid mountain biker, logging anywhere from 25 to 100 miles a week. “Marquette to me is the perfect fit,” he said. “Comfortable, like a well-broken-in pair of boots. It's got everything I was looking for. But Kozeluh, of the county’s visitor’s bureau, said the DNR can be slow to appreciate the economic impact of “non-motorized” activities like mountain biking, in part because it is hard to count everyone engaged in the sport. Unlike hunting or fishing, it takes no license or registration to hop on a mountain bike and ride. “They don't get it,” she said of the DNR. Alone the coast just above Michigan’s thumb, a new generation of outdoor thrill-seeker has found kiteboard Nirvana on a sandy spit of land called Tawas Point. It projects like a southward-curving hook into shallow waters of Lake Huron, as rising afternoon thermal winds often afford ideal kiteboarding conditions on either side of the spit. Dozens of kiteboarders soar over the waves when conditions are right, as online message boards suggest some come from Chicago and beyond. That in turn has spawned three area kiteboard venues, including Great Lakes Kiteboarding. Operating out of a tent on the beach, it offers lessons in both kiteboarding and paddleboarding. The business also has a brick-and-mortar shop in St. Clair Shores. “It has certainly grown significantly since we started in 2002,” said manager Melanie Lefeve. It's called Barry-Roubaix, a nod to the Paris-Roubaix, an even more torturous annual French road race over ancient cobble roads known to bend wheels and crack frames. But all that pain has been good for Hastings, a community of about 7,000 people. Launched in 2009, it had 274 entrants its first year. In 2016, 3,200 riders competed in races of 22 miles, 36 miles or 62 miles, most of it on gravel roads in Barry County. Tapping into that, the city earlier this year installed 65 permanent signs marking the race route, paid for by a $5,000 local foundation grant, $2,500 from the city's Downtown Development Authority and $2,500 from race organizer, Kisscross Events. Klein said the city is also planning to install a trailhead for the race start, somewhere in the downtown area. It's easy to see why Hastings is eager to embrace this event. An economic impact report on the 2016 race calculated that participants and friends and family spent $565,250 on food, beverages, lodging and fuel for the event. Participants from 32 states, Canada and the United Kingdom traveled to Hastings. Community director Klein said the hope one day is to convince some of these bikers to take a second look at Hastings and its nearby lakes, camping, annual jazz festival and small-town friendliness. In Grand Rapids, local officials are pushing an ambitious plan to restore rapids to the Grand River through the heart of downtown. A $30 million project, it will likely depend on a mix of community, philanthropic and state and federal funding sources. It also faces an array of federal permitting hurdles if it is to gain approval to remove five existing dams and improve the river bottom. But a 2014 study showed the potential: An estimated $16 million to $19 million in annual economic impact tied to water tourism including kayaking, fishing and rafting. It would surely further the transformation over the past couple decades of the city's once-moribund downtown into a thriving entertainment and residential center. Matt Chapman, of Grand Rapids Whitewater, the group backing the project, said it would tap into new ways for residents to enjoy the river, which shaped the city's earliest days as a center for logging and trapping. Great article about Michigan! However, I wish there was at least a mention of the extensive ORV trails (and the rising costs associated with driving off road) that Michigan has to offer. Not really mentioned, but Michigan should be an epicenter of road biking. The DALMAC is a start, but it could be much bigger (Look at the success of the RAGBRAI, the Des Moines Register-backed ride across Iowa.) Great summer riding weather, good mix of hills and flats, nice towns and lakes...and as the article pointed out, lots of folks on $4,000 bikes backed up with $50,000 SUVs. Actually I see more $7000 Mt.bikes on $2000 Subarus! Fixing the roads would be a good start toward attracting road cyclists. And fixing drivers' attitudes. Should bikes pay license fees? Doing what you want, bike lanes everywhere, is hugely expensive. To the best of my knowledge, IMBA maintains and builds its own single tracks. A lot of what's being seen is a growing diversity of sport/activities where people pursue fewer and different activities but more intensively those that they do participate in. Sporting goods store seen to have no problem bringing out $1400 fly rod outfits and $1600 bow and arrow packages, along with $7000 Mt bikes. I would assume people are buying them. And there seems to be no lack of company on those special primetime occurrences that each sport offers. Recognizing that you can't come close to doing justice to a dozen different activities so specializing in a small handful just makes sense and is a sign of maturity. I think a lot of young people are looking for activities that have a payoff in how you feel physically and a sense of accomplishment. Fishing and hunting are more sedentary activities with a lot of sitting around or some walking with often nothing to show for the time spend on it. I said "often" nothing to show for it, sometimes you can be successful but there is a lot of sitting around. The appeal is lost for a lot of young people. I take it you have not hunted or fished as a sport! Thanks! This story shows that times are changin'. Will MI wake up? The DNR and Pure MI both say here that they are promoting non-moto outdoors -- but how much? Are non-moto activities properly represented everywhere in govt at the levels suitable to their impact and potential? What about outdoor education? We used to have Outdoor Centers then closed them all in the 90's. No wonder our state is sick and obese. We need to totally turn this around. OC's need to be re-opened and expanded from schoolkid ed to incl adult programming. I see quotes about promoting our qualities abroad. ...First we gotta take care of locals! My impression from a few years in promoting outdoor rec is that there is nearly ZERO awareness of our WORLDCLASS local outdoor resources. When it does exist it's highly specialized. At the same time our campgrounds are packed to the gills. Sorting out our outdoor rec situation is hugely impt w great potential! Pay as you play. Permit fees should be used to maintain the rec areas. Great article! I ride my bike more than 100 miles a week most of the year. Michigan is a terrific place for this. We do need to replace old, rough sections of paved bike paths, keep building new mountain bike recreation areas (maybe turn old golf courses into these), and educate the public about car/bike safety. More bike routes through cities will continue to pay dividends. But I do enjoy golf and fly fishing, too. Anyway, really good article about setting priorities for the future. "A lot of this has happened with little help from government."...Bingo! No where did I see anything about this article only being about "non-motorized sports". As and avid Mountain Biker and an Dirt Bike rider I know the cost associated with both sports. The economic impact is huge. I have to buy a permit for $36.00 per year for each ORV I operate. I believe ALL user groups should have to pay for user permits not just a select few. This would fund a lot of opportunity for the state. We hardly fish anymore and haven't purchased licenses in years for the most part because the shoreline of our favorite launches and fishin' holes has been purchased and built-up with condos and McMansions of the wealthy. Just getting to the water is a major hassle anymore, especially for those who don't own a boat. Combined with the warnings of mercury ingestion and the vagaries of fish stocks to fishable size, it's just easier to find something else to do. Scott Jordon is quoted as stating that forestry is not sustainable in Michigan. I believe that nothing could be further from the truth. The Michigan Forest Products Council has much research that proves that forestry is in fact sustainable in Michigan. Statewide we only harvest and lose to mortality, less than half of our forest growth. And remember, trees do regenerate. Research has also been done over the years to indicate that communities with both natural resource industry AND tourism jobs are much better off economically than communities with just one or the other. Tourism jobs are great and individuals that live in the rural communities thrive on those jobs. However tourism jobs are generally minimum wage and seasonal. In a family, if one spouse can work in the manufacturing industry at a family sustaining wage with benefits and the other spouse can work in a tourism related job, that family is better equipped to handle the peaks and valleys related to each job and it’s economic return. I believe from the conclusions quoted that Mr. Jordon's report may be flawed.